What are some must-haves for a well-stocked kids' craft box? See this checklist to find out what you might be missing and what you need for a box of fun crafts materials the next time your kids say they're bored or it's rainy or too hot or cold to play outside. 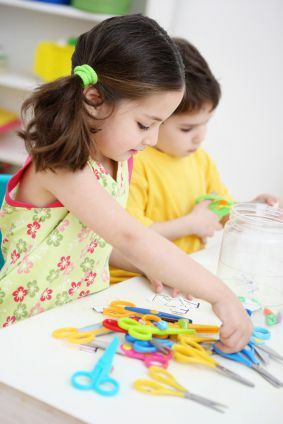 Whether you and your kids are making some fun summer crafts, spring crafts, or lovely gifts or decorations for Mother's Day, Father's Day, Easter, or other holiday, kids' arts and crafts supplies can help them exercise their imaginations and hone their fine-motor skills as they cut, paste, and draw to create their personal works of art. No kids' craft box is complete with out some good-quality markers, crayons, and pencils in all sorts of different colors. Another great thing to have in a kids' arts and crafts supply box is a wide variety of paper (card stock, construction, even pretty vellum) in an array of beautiful colors. Kids adore painting, whether it's with a brush or with their fingers. Let them get messy with (washable!) paint -- another good staple for a kids' craft box. Some good glue is also an essential item for a kids' craft box. Another great addition to any kids' craft box is that old standby -- colorful pipe cleaners (also called chenille stems). They can be twisted around to make stick figures or can be used to make beautiful crepe paper flowers and tissue paper flowers. You can also add some googly eyes and pom-poms (also commonly found in arts and crafts or stationery stores, just like pipe cleaners) to your child's crafts box so that he can make faces or creatures using all three materials. While a good pair of kid-safe scissors are an essential part of any kids' craft box, some paper edger scissors can help kids create fun borders, strips, and shapes with paper. Kids can make beautiful and adorable crafts with felt, like bright and colorful -- not to mention useful -- pouches to store everything from coins to small toys. Beautiful and colorful decorative buttons can be a wonderful addition to a kids' craft box. Older kids can sew buttons onto crafts while younger children can glue them on to paper, felt, or whatever other craft materials they are working on. Colorful beads are so much fun! Kids can string them up on cords and embroidery floss to create pretty bracelets and necklaces to wear and share with friends. These are also perfect for adding into DIY stress balls. Satin rattail cords are a gorgeous item to add to a kids' craft box. They can braid them to make friendship braided bracelets, put beads on them to make necklaces, and glue them on wherever they want to add a bit of shine and color. Another great material for friendship bracelets is embroidery floss, though younger children may do better with ribbons or rattail cords, which are thicker and easier to work with. Washi tape, the decorative Japanese masking tape that's easy for kids to use, is another perfect item to add to a kids' craft box. Get several colors and patterns of washi tape and let kids use their imaginations to create cards, pictures, butterflies, flowers--whatever they can think up!